Complementing Brown & Miller's recent Concise Encyclopedia of Syntactic Theories (1996), to which this is a companion volume, this encyclopedia is a collection of articles drawn from the highly successful Encyclopedia of Language and Linguistics. It presents a collection of 79 articles, all of which have been revised and updated. It also provides a number of newly commissioned articles, one of which has been substantially updated and extended. The volume is alphabetically organised and includes an introduction and a glossary. 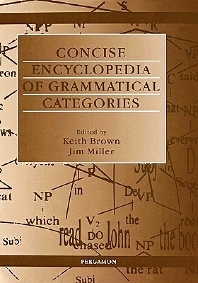 The Concise Encyclopedia of Grammatical Categories will provide a uniquely comprehensive and authoritative overview of the building blocks of syntax: word classes, sentence/clause types, functional categories of the noun and verb, anaphora and pronominalisation, transitivity, topicalisation and work order. For linguistics departments, institutional libraries and individual linguistics researchers. Editor's Foreword. Introduction. Adjectives (R.M.W. Dixon). Adverbs and adverbials (J. van der Auwera). Agreement (G.G. Corbett). Anaphora (P. Sells, T. Wasow). Apposition (N. Burton-Roberts). Aspect: basic principles (O. Dahl). Aspect: further developments (J. Miller). Aspectual type(s) (C. Lehmann). Auxiliaries (S. Steele). Binding (I. Crookston). Case (J.M. Anderson). Categories, linguistic (G.K. Pullum). Classifier languages (C.A. Craig). Comparative constructions (I. Crookston). Concessive clauses (E. König). Conditionals (F. Veltman). Conditionals, grammatical (J. Haiman). Connectives (J. Caron). Constituent structure (P. Jacobson). Control (E. Jaworska). Converb (M. Haspelmath). Coordination (C. Grover). Conference (R.A. Muskens). Counterfactuals (F. Veltman). Definiteness (C. Lyons). Deixis (S. Levinson). Determiners (J. van Eijck). Evidence and modality (D. Blakemore). Factivity (P.A.M. Seuren). Finiteness (M. Koptjevskaja-Tamm). Functional relations (R.D. Van Valin, Jr). Gender and gender systems (G.G. Corbett). Genericity (M. Krifka). Grammatical units (R.E. Longacre). Grammaticalization and lexicalization (E.C. Traugott). Head and modifier (L. Bauer). Head marking (A. Spencer). Honorifics (M. Shibatani). Indirect speech acts: inferring the illocutionary point (K. Allan). Information structure (W.A. Foley). Interjections (F.K. Ameka). Logophoricity and long-distance reflexives (L. Stirling). Mass expressions (M. Krifka). Modality (F. Kiefer). Mood and modality: basic principles (F.R. Palmer). Mood and modality: further developments (F.R. Palmer). Moods, clause types, and speech acts (K. Allan). Negation (P. Ramat). Nominalizations (P. Muysken). Noun incorporation (W.J. de Reuse). Nouns and noun phrases (J.R. Payne). Number and number systems (D.A. Cruse). Particles (D. Hartmann). Parts of speech (R.L. Trask). Passive and related constructions (I. Roberts). Perfect (O. Dahl). Performative clauses (K. Allan). Phrastic, neustic, tropic: hare's trichotomy (K. Allan). Polarity items (F. Zwarts). Possession (J.R. Taylor). Prepositions and prepositional phrases (E. Jaworska). Proper names: linguistic aspects (A. Lehrer). Reflexives and reciprocals (F. Lichtenberk). Relative clauses (N. Fabb). Resultatives (D.J. Napoli). Sentence types and clause subordination (R.D. Huddleston). Serial verbs (M. Sebba). Speech act verbs (J. Verschueren). Speech acts and grammar (K. Allan). Subordination and complementation (N. Vincent). Switch-reference and related phenomena (L. Stirling). Tense (B. Comrie). Topic and comment (J. van Kuppevelt). Topic, focus, and word order (R. Sornicola). Transitivity (T. Tsunoda). Valency changing alternations (R.L. Humphreys). Verbs and verb phrases (R. Cairns). Voice (M. Shibatani). Word order and linearization (A. Siewierska). Glossary. List of Contributors. List of Major Language and Linguistics journals. Name index. Subject index.